The basic idea was a cheerful and musical intervention in public space for the three roundabouts of N208 nearby the city center of Hillegom. The intervention should be autonomous but also refer to the other two locations, they should connect the three roundabouts with each other. The use of bright colors is essential and inseparable from the character of Hillegom; situated in the centre of the ‘Tulipsbulbs production’. 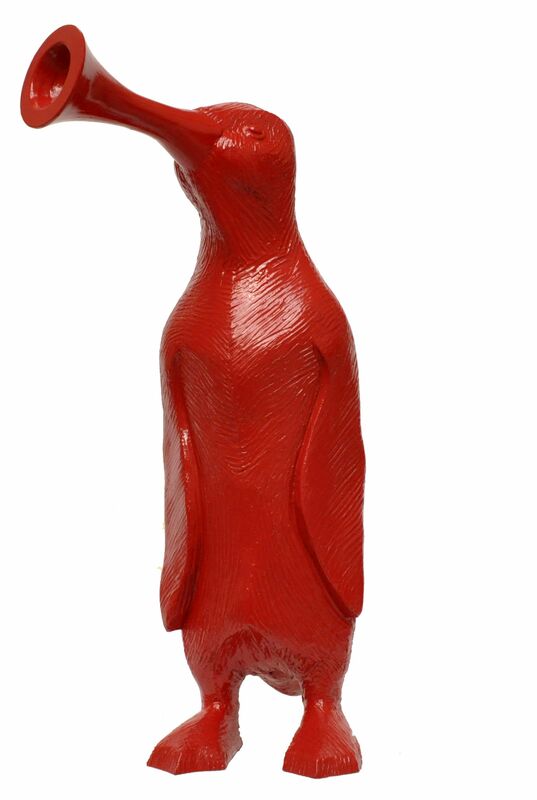 Ruby, the penguin, differs in snout from the original penguin. The beak is replaced by a horn. Partly because of the noise that makes the penguin naturally and strongly reminiscent of a trumpet or horn. But partly also to connect Ruby with Hillegom. The horn also refers back to shape of the flowers that are so characteristic of Hillegom. The repetitive nature of the flowers and the flowers fields have a strong resemblance to the visual aspect of repetition of Ruby.